Gradually the prom culture is coming into effect worldwide as a result of the great influence of American movies and TV serials on other countries. A promenade dance which is mostly known as a prom dance in the United States. This is a semi-formal gathering or dance party of the graduating high school students. It is held every year at the end of the senior year. High school students keep waiting the whole year to participate on this occasion. And the most interesting part is that a Prom King and a Prom Queen are revealed at a prom who are selected by a prior voting. You can have a gorgeous look including prom nails at a prom to make the last days of your school more memorable. Prom nails cannot complement your look unless they are associated with compatible outfits. You must choose one of the best dresses you have to take part in a prom. Because it’s all about showing off the best dance skill you have wearing amazing dresses. That’s why you have to be careful to choose the right color combination and designs while having nails for prom. Black, maroon, pink, red and blue are the dominant colors of prom nail designs. I am going to discuss the nail ideas for prom and implementation of these colors to have perfect nail designs for prom. If you are planning to wear a dress having stones attached to it, you can choose this ballerina nail design. A ring on the ring finger will add extra beauty to these prom nails. You can paint your nails this way to have a matching nail design with your partner. If your partner wearing a bowtie then drawing one or two bowties on your nailbeds will complement your pair up. If you are wearing a bright pink dress and want to adorn your nails with the perfect nail design, here is a great suggestion for you. The process is simple french manicure but the output looks great. You can add a bit of glitter to add glam to the nails. There is nothing parallel to the hotness of red. And for a party like a prom, red remains at the top of the priority list. 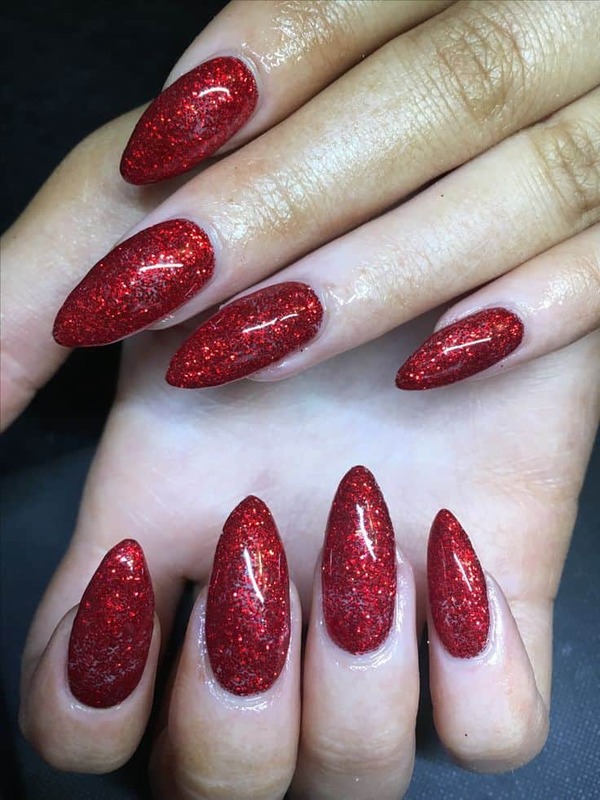 You can make the deadly combination of red attires and red nails to have attractive prom nail designs. This is a simple black design for your nails for prom. Black is one of the most used colors for a prom party. So, using black will come handy for sure. If you want to wear a dress of lite colors, you can have grey or brown matte nails as illustrated in this picture. And the diamonds will do the needed sparkling for your prom nail designs. You can combine some rhinestones at the bottom edges of your nails to make them glow even on the dark night of prom. long nails have become very popular lately for prom nights. You can have any lite colors painted on your long almond nails with the presence of antique gold or silver color rings, jewelry. Burgundy differs from maroon in a very subtle way. Burgundy dresses are favorite among the girls on prom night. 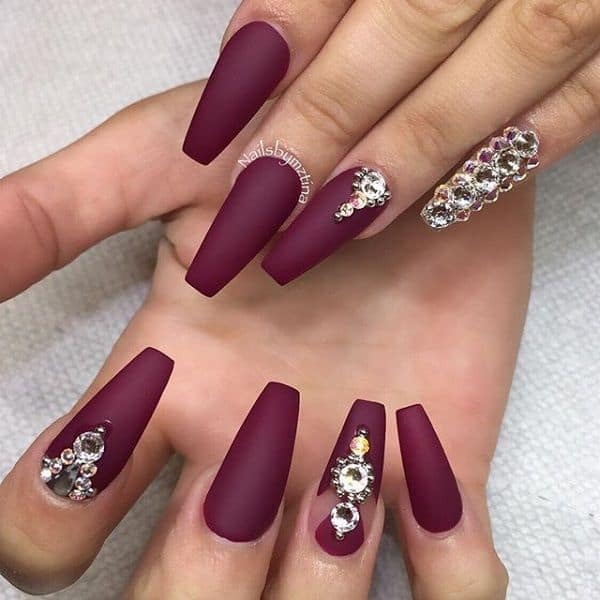 You can select this burgundy design to have matching nail ideas for prom to flatter the burgundy dress. Solar nails can be a good choice to have as prom nail designs. The shiny tip of the nails will help you shine brighter than anybody. What could be more glamorous than this design? You can accentuate your red nails by using silver accent nails. The relevant jewelry makes this design look like something out of the world. This is the best choice for prom nails for red dress. Prom can be the perfect occasion for showing off your little black dress. Black is an elegant color that is allowed for both formal and informal gatherings. 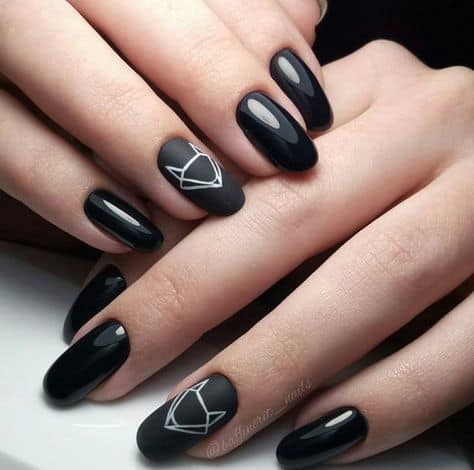 You can have these glossy black nails to design your prom nails for black dress. Ballerina shaped nails are beautiful without adding anything extra . But, a bit gradient look can change the overall look of pink ballerina nails. You can use light pink color to have prom nail design like these ones. Dazzle the eyes of the participants of the prom by the gold shine of your nails. Don’t forget to wear dresses that will complement your nails for prom. This color has a sheer intensity of itself. You can paint your nails with dark purple color to add personality to your nails for prom. 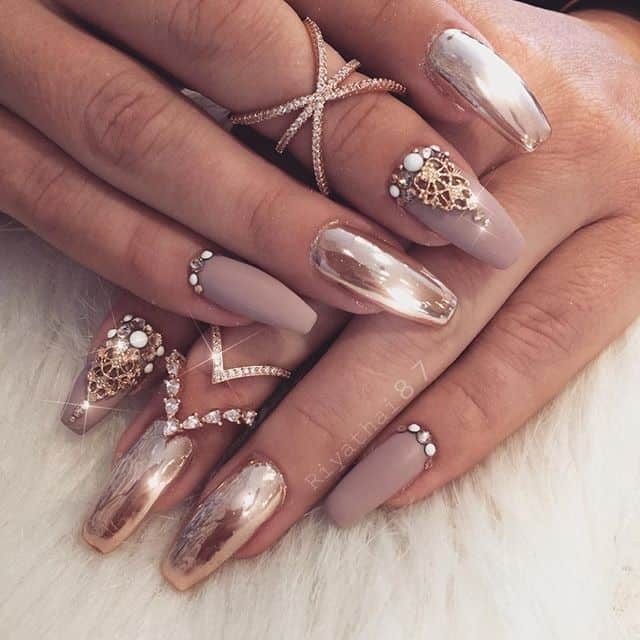 These nails are so gorgeous that they will suit the nails of the Prom Queen. Forget it! If you are a queen to yourself, let’s have these silver prom nails to rock the dance floor at the prom night. There are always a few individuals who like to keep it simple on whatever occasion it is. These nails are for them. You can paint your nails with a neutral color to have these simple nail designs for prom. If you are searching for the perfect design for your royal blue dress, you can surely try this simple design. Paint all your nails with royal blue color and add some gold ombre glitters at the bottom edges of the nails to have prom nails for royal blue dress. Planning to wear a pair of shoes that will expose your beautiful toenails? Nothing to worry, we have a stunning toenail design for you. You can add rhinestones to the prom toenails to make them shine brighter. Love at a young age is the queerest feelings you’ll get. Speaking from experience, express your love or you’ll lose it forever. So, paint your nails with heart shape to indicate that you’re in love with somebody. Hope your special one will get you right at the prom party. Prom is a momentous occasion for every school graduates. We understand your feelings and that’s why we have come up with the best ideas for your prom night. Choose the designs from here and rock the dancefloor at the prom. Advanced congratulations on your graduation! All the best for the days ahead. What Are Pink & White Nails Aka French Nails?